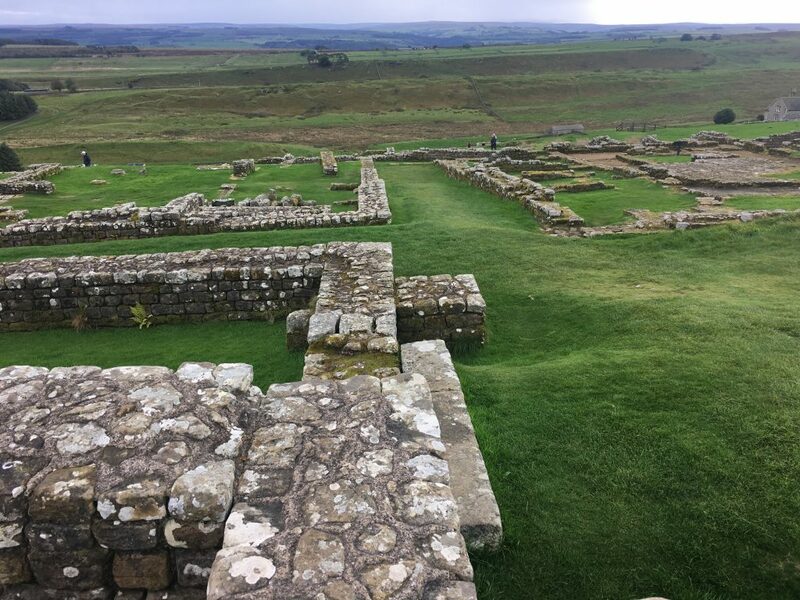 Having crossed the border back into England we thought it was only fitting that we visit Hadrian’s wall to see how the Roman empire managed the border with the wild lands outside it’s control. We drove into Northumberland National Park past signs for the Golf Masters tournament which was on that weekend. Luckily for us we were too late for any traffic issues and sailed through on nice quiet roads. 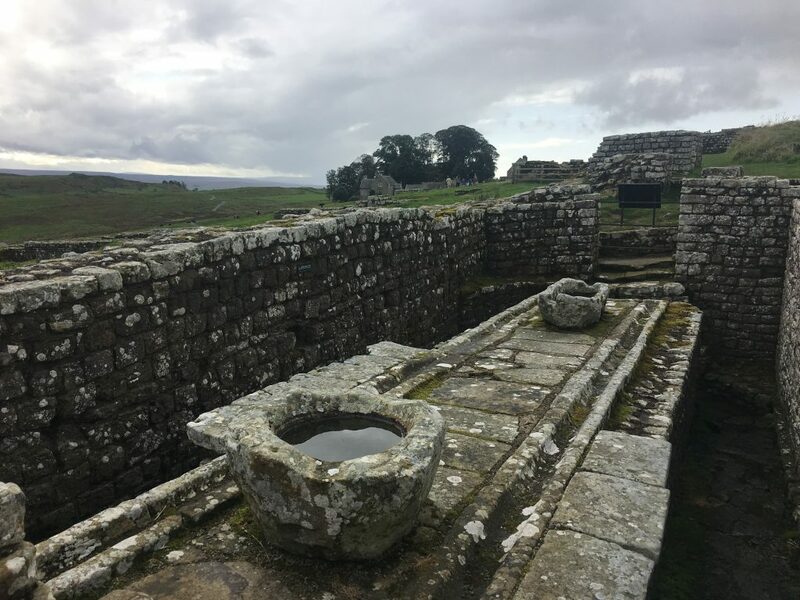 Our destination was Housesteads Roman Fort. We had originally wanted to walk a few miles along the wall but Paul had woken up with a stiff neck and by the time he had driven this far he wasn’t feeling very mobile, so instead we satisfied ourselves with a simple visit to the fort complex and associated exhibition. I wasn’t very impressed by the exhibition which seemed quite simplistic. 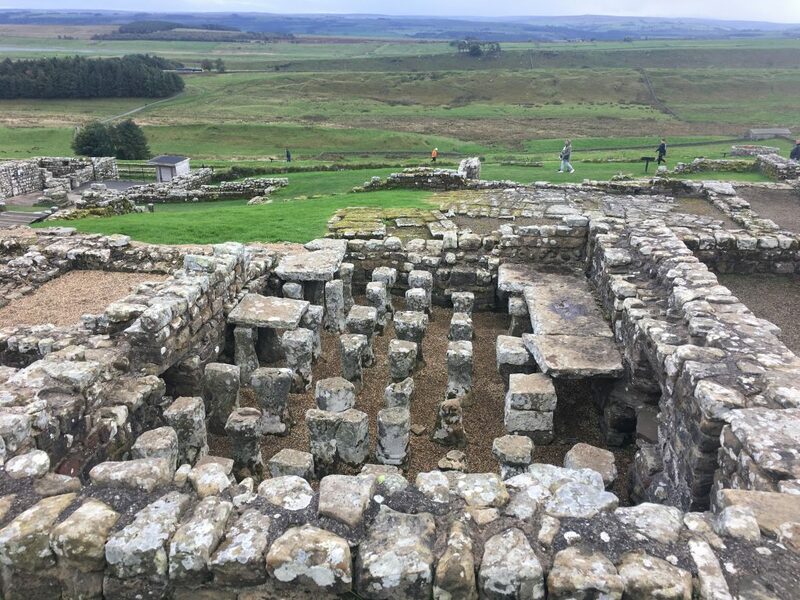 I’m sure that the one at Vindolanda was a lot better, although I went there about 17 years ago so my memory may not be entirely accurate. The fort complex was interesting though, you could see how the standardised layout had been overlaid onto the hilly site with very little regard for appropriateness to the landscape. I couldn’t help feeling sorry for the Roman soldiers who were posted here, especially while the fort was still being built. We had decided on a campsite that evening so we made our way back towards Hexham and Wellhouse Farm campsite. 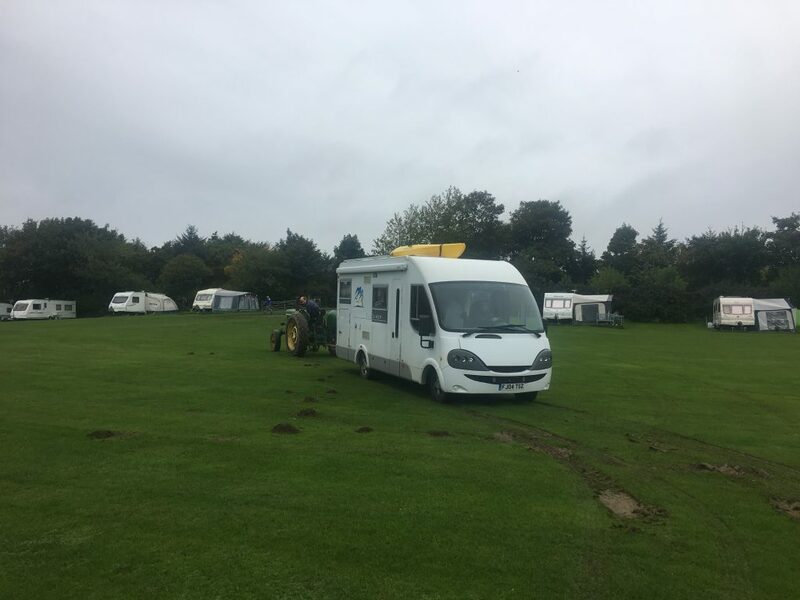 We arrived but couldn’t find anyone to tell us where to pitch up, we had a quick chat to another motorhome owner who said he hadn’t been able to find anyone either and had just parked up. He also warned us that the showers weren’t working which was a shame for Paul as he was hoping for a long hot shower to relax his neck muscles. We parked up on the grass while I went for a bit of a further explore and found that the lady’s showers did work but were a pathetic trickle of luke warm water so we would probably be best off filling up with water and showering in the van. Except we couldn’t, because we were stuck. I managed to ring the farmer and he agreed to come and tow us out the following morning, so Paul had a shower in the van with our remaining water while I went back to the shower block and tried to make the most of the dreadful shower. We talked about why this campsite felt so poor and decided that it was pure disappointment. After all it was only £12 a night, and we’ve paid as much to stay on campsites with no shower block at all and felt like we got reasonable value. But the fact that modern, hot, showers are advertised and not delivered turned us off completely. Isn’t it funny how our minds work.